Lidt mere nyt vedr. GKIDS' Studio Ghibli-udgivelser. First thanks to everyone for your kind words and enthusiasm!! It's surreal to have gone from owning a VHS tape as a kid to putting our logo on the same film decades later. Literally a dream come true. - we may have gotten carried away with "ALL FILMS". The actual press release is more specific... we will now have all films in our collection except Grave of the Fireflies (always excluded due to the fact it is not represented by Ghibli in USA), and The Wind Rises, which is still new. 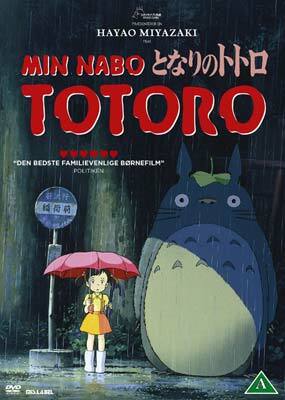 And we are not going to re-release our current Ghibli titles (Poppy, Ocean Waves, Only Yesterday, Kaguya, Marnie). I'm proud of them, think we did a great job, and there's nothing I'd change yet. - We are starting to release the catalog titles in October and will release a few new ones each month with a goal to get them all on shelves by end of Q1 2018. - Yes this includes Yamadas on Bluray. I am really looking forward to spreading the joy of that film across the land. - Artwork is going to be similar to previous US editions on some releases, different on others. It will be revealed this week for the October titles. Every Bluray will have a translated booklet, DVD and BD combo will have O-cards (slipcovers). - You should all get your Kiki's Delivery Service tickets this weekend!!! English dub on Sunday / subtitles on Monday. We are going to do a great job, but the best place to see these films is still in a theater. Find a theater near you at FathomEvents.com. Mislabel har flere Ghibi-titler på vej på dansk... Og har også købt de danske rettigheder til Your Name. DeathPosture, hvilke film drejer det sig helt konkret om?... Kunne de sige noget om det? Princess Mononoke kommer på Blu-ray i Danmark inden jul.